JUST CLIP & GO WITH THESE SOFT FASHIONABLE EYEGLASS HOLDERS! If you wear eyeglasses, you know what a huge inconvenience it can be to properly store your eyewear. 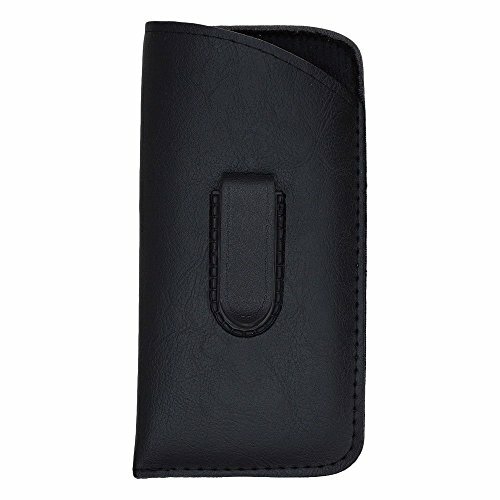 Most eyeglass cases are bulky and take up a lot of room, and the thinner pouches have a tendency to offer no support. Some holders are too huge to fit into your purse, backpack, or pocket. Even more so, sometimes digging around in your bag to locate your eyewear can be a real hassle. That is why OptiPlix has created our faux leather Soft Eyeglasses Pouch Holder with clip. This clip is one of a kind as it allows you to keep your eyeglass pouch out in the open and attached to your pants, skirt, jacket, purse, or wherever else you need it! It makes retrieving and putting away your glasses a much easier activity, and with its compact size you can do so much more with this case! Our sleek and slim eyeglass holders are notably made for everyday travel and are sized perfectly so that they can be used for storing makeup, cellphones, jewelry, money and more! These cases do not have to be worn on the outside with the clip--they are small enough to fit into pockets, too! We have these elegant eyeglass holders available in the timeless neutral colors of Black and Brown so they match everything in your wardrobe! You also can choose to purchase these cases as a 1 Pack, 2 Pack, 3 Pack or 4 Pack. BELT CLIP:The clip on the eyewear holder allows you to keep your holder out in the open and clipped to your pants belt, skirt, jacket , purse and more! It makes retrieving and putting away your glasses a much easier activity. 1PK, 2PK, 3PK OR 4PK: At OptiPlix we provide you with the option to buy not just one, but a two, three, or four pack of these eyewear cases. It's common to misplace these cases so the more you have the better. Be prepared! FITS MOST STANDARD SIZES: Our eyeglasses holder fits most standard sized glasses and shades. They are versatile and are great for holding eyewear for people of all ages! Men, women, and children get lots of use out of it! MODERN DESIGN: Our stylish Pocket Style glasses cases are available in neutral black and brown, so they never clash with your wardrobe. These holders easily add a subtle touch of style to your outfit without you even trying! MULTIPURPOSE USE: You can use these holders for more than just holding your shades! These cases case can be used to to store credit cards and IDs when a purse won't do. You can also store your smartphone or cash in it, too!